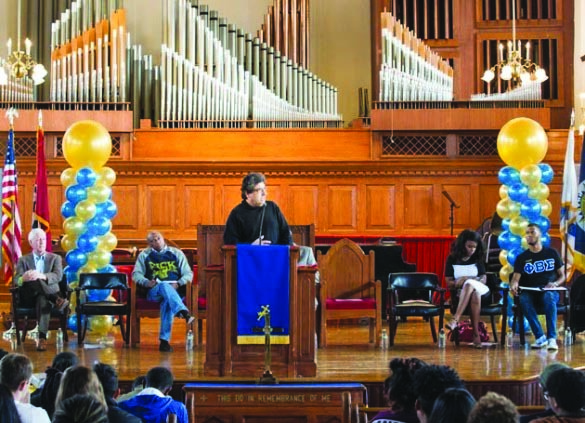 NASHVILLE, TN — Standing on the same dais from which Dr. Martin Luther King Jr. spoke during the civil rights movement, Chancellor Nicholas S. Zeppos charged more than 300 college students gathered Saturday at Fisk University to live out the civil rights leader’s legacy. College students from Belmont, Fisk, Lipscomb, Nashville State, Trevecca Nazarene and Vanderbilt spent the afternoon of Jan. 14 volunteering with food security projects across Nashville. 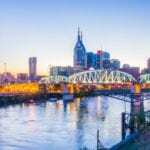 College students from area colleges and universities, including Belmont, Fisk, Lipscomb, Nashville State, Trevecca Nazarene and Vanderbilt, spent the afternoon volunteering with food security projects across Nashville. The day of service was part of a weekend of events marking MLK Day. Frank Sims, Fisk’s interim president, and Bob Fisher, Belmont’s president, also spoke, reminding the students that their service would impact their lives, and that the opportunity to serve should be viewed as a privilege. Freedom Rider Ernest “Rip” Patton Jr., who was the drum major at Tennessee State University in 1961 when he joined the civil rights movement, spoke to the audience about his experiences fighting segregation in the 1960s. He was arrested as part of the Freedom Ride to Jackson, Mississippi, and was expelled from TSU for his participation in the rides. He reminded the students that the future was in their hands and encouraged them to stand up to oppression. “I’ll be looking for you in the news,” he said.